KUALA LUMPUR: The property market may be affected by the global economic factors but local demand has not been dampened, according to some property developers. 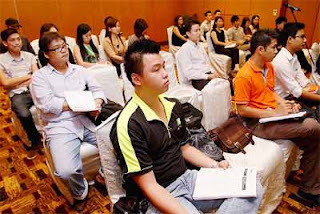 Low Yat Group sales and marketing executive Sean Saw said there was interest among Malaysians especially the younger adults to purchase property although the economy may be holding some of them back. “I gather that even though the property sector may be quieter due to external factors, but there are still transactions. Newly launched projects continue to be sold out, surprisingly,” he said after a briefing for exhibitors at the Star Property Fair 2012. He added that the market for sub-sale may be slower but the overall market was expected to be back in full swing next year. Saw said the fair would be a great avenue to raise awareness among homebuyers about Low Yat's high-end projects, especially its Tribeca serviced apartments to be launched this quarter. LBS Bina Group Bhd's managing director Datuk Lim Hock San also concurred noted that despite the economic uncertainty, there was still demand in the local property market especially the affordable homes. “This can be seen in our recently launched Royal Ivory double-storey double storey cluster link semi-detached development where over 300 units were fully sold in three months,” he said. LBS which is participating again in the Star Property Fair after a hiatus last year said that it was back with exciting projects. She added that the fair would serve as a branding channel for LBS to convey its lifestyle living range of products to the homebuyers. Bukit Gambang Resort City developer Sentoria Group Bhd would also be exhibiting, promoting its investment development within the Bukit Gambang resort city that include commercial and residential projects. Sales and marketing senior executive Cony Tan said that the fair would be a great ground for Sentoria to get more exposure and reach new customer as it used to only reach out to existing customers through its buyer-get-buyer scheme. Bucking the trend: Exhibitors attending the briefing. Some property developers say newly launched projects continue to be sold out. “All the while we invite existing customers to our events but since launching our villas, we are trying to market our products through different channels,” she said, adding that Sentoria has started participating in roadshows and exhibitions in the second half of the year. 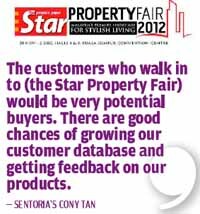 “The customers who walk in to (the Star Property Fair) would be very potential buyers. There are good chances of growing our customer database and getting feedback on our products,” she said of what to expect at the fair. The Star Property Fair, in its fourth year rolling, would be held from Nov 30 to Dec 2 at Kuala Lumpur Convention Centre. KUALA LUMPUR: Naza TTDI and Australia's Lend Lease plan to undertake a mixed-use development project in the former's KL Metropolis flagship development with a potential gross development value (GDV) of RM4bil. Both companies signed a heads of agreement to formalise a joint venture to develop 10.94 acres of land at the site. In a joint statement released on Tuesday, they said the agreement sets the scope and commercial principles for a mixed-use development including a regional retail centre, office, hotel and residences. The agreement was executed by Naza TTDI's deputy executive chairman and group managing director, SM Faliq SM Nasimuddin and Lend Lease's CEO for Asia, Rod Leaver. Australia's Lend Lease is a fully integrated international property and infrastructure group. KL Metropolis is Naza TTDI's 75.5-acre high-impact project with a GDV of RM15bil which it envisages would thrust the country as a preferred MICE destination in the region. KUALA LUMPUR: Naim Holdings Bhd plans to launch a real estate investment trust (REIT) with a property value of about RM3bil. The REIT would be launched within six to nine years when the property assets have reached "sufficient size", said its senior director for corporate services Ricky Kho. 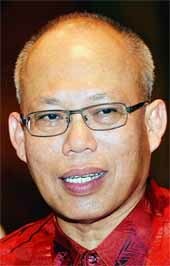 He said on Tuesday it was the Sarawak-based Naim Holdings' long-term plan to generate recurring income and gain in property value. For the REIT, the completed project is the two-storey Miri Permy Mall. Its occupancy rate is 94% and it is expected to generate rental income of RM8mil per annum. The estimated fair value for the building and land is RM85.0mil and RM3.6mil respectively as at Dec 31, 2011. Kho said the other properties under the proposed REIT would include mixed development projects which would be launched during the six to nine years.